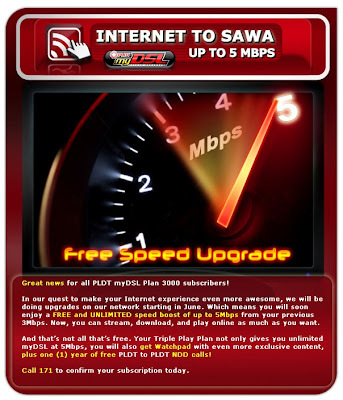 I have been a PLDT DSL subscriber since I have ditched the old modem and prepaid internet cards. I am just glad that I have PLDT as my provider since I do not need to worry about internet connection and being disconnected to the cyberworld even PAGASA raised the storm signal to 3 in Metro Manila. 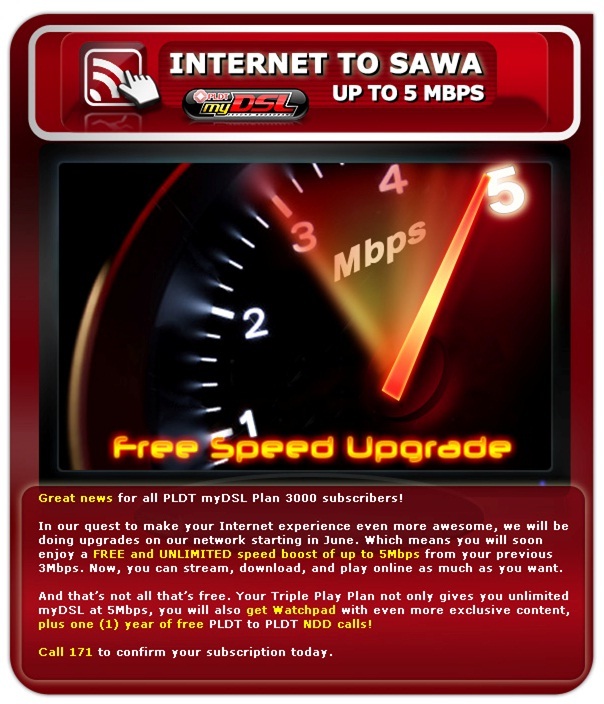 PLDT continues to race with other internet providers by giving not just 5MBPS speed but up to Sawa! Imagine that one can just download movies, play online games, update status messages and just BLOG simultaneously with such a speed. There is no need for me to turn on the TV set while I wait for the movie to download completely. There is no waiting for me to upload my pictures in my online album while I am doing my nails. I think we that speed I have to put my messenger status into DND mode as I can finish all the downloading, uploading, blogging and sharing in a few minutes. This is open to all myDSL PLAN 3000 Subscribers. Visit www.myworldmydsl.com for more information or call 171 to confirm your subscripstion today! Amazing how we get to be the first to be updated with such great deals - from new products, campaigns, community service, and even movie screenings. It is truly amazing to be part of the Nuffnang Family which gives us FAST and SPEEDY update on what is in and what is happening in the Metro (and even cyberspace!). Are you qualified for the promo? Contact PLDT to confirm. Fast. Now!